House Republican leaders cheered passage of their sweeping tax overhaul Thursday, but 13 GOP lawmakers bucked their party and voted against the bill. All but one of them hailed from New York, New Jersey and California — each a high-tax state. 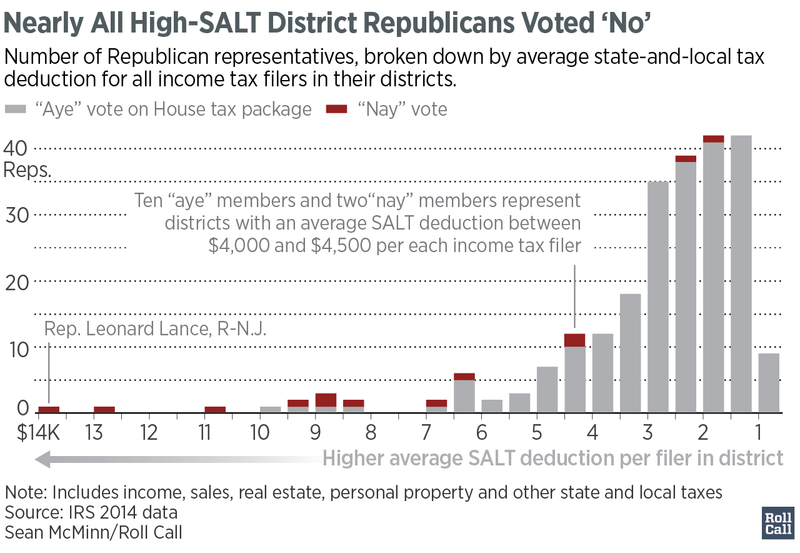 These lawmakers largely opposed the legislation because it curtailed the state and local tax deduction, also known as SALT. The measure caps the deduction for property taxes at $10,000 while eliminating the tax break for state and local income or sales taxes. Six of the lawmakers are in competitive races in 2018 based on ratings by Inside Elections with Nathan L. Gonzales. Eleven of the 13 Republicans are being targeted by the Democratic Congressional Campaign Committee. Like other New Yorkers, Donovan opposed the bill over the restrictions made to the SALT deduction. He was first elected in a 2015 special election and won his first full term last fall by 26 points. President Donald Trump carried his 11th District by 10 points. Donovan also voted against the GOP health care bill in May and faces a primary challenge from former GOP Rep. Michael G. Grimm, who served eight months in prison for federal tax fraud. Democrats are targeting the seat, which is based in Staten Island, with a crowded field vying the nomination. Inside Elections rates the race Likely Republican. Faso also opposed curtailing the SALT deduction and said the bill contained too many loopholes. He ranks third on Roll Call’s list of most vulnerable House incumbents. Trump carried his 19th District but the central New York district voted twice for former President Barack Obama. A crowded Democratic field is vying to take on the freshman lawmaker, with two contenders outraising Faso in the most recent fundraising quarter. Inside Elections rates the race Tilts Republican. Frelinghuysen’s position was unknown heading into the final vote, but the House Appropriations chairman ended up opposing the bill. He is a DCCC target in 2018 and his race is rated Likely Republican. Two Democratic hopefuls have outraised him by nearly three times in the most recent fundraising quarter. Trump carried his 11th District by 1 point last fall while Frelinghusyen was winning a 12th term by 19. The most vulnerable incumbent so far, Issa opposed the bill over the SALT deduction changes and the effect that would have on families. He faced a closer-than-expected re-election last year, winning by just half a point. Clinton carried his Southern California district by 8 points. Mitt Romney took the district in 2012, while Obama carried it under its current lines in 2008. Inside Elections rates the race a Toss-up. Jones is one of the few Republicans to reject the bill over concerns about increasing the deficit. He also voted against the GOP health care bill, and has been known to buck party leadership. America First Policies, a pro-Trump outside group, launched a $100,000 cable TV and digital ad urging him to support the tax plan. The 3rd District congressman has fended off primary challengers in recent cycles and won re-election to a 12th term last fall by 34 points. His race is rated Solid Republican. King also voted “no” due to the SALT deduction changes, and he warned that passing the tax bill would cause Republicans to lose House seats next year. The 13-term congressman is a new DCCC target though Trump carried his 2nd District by 9 points. One of the Democrats hoping to take on King, Tim Gomes, has loaned his campaign $1 million. Inside Elections rates the race Solid Republican. Lance also opposed curtailing the SALT deduction. The fifth-term congressman is a DCCC target next year in a race rated Likely Republican. Clinton carried his 7th District by 1 point last fall. Lance also opposed the GOP health care bill. A member of the moderate Tuesday Group, LoBiondo opposed the tax bill because of the changes to the SALT deduction and said in a statement it would be “detrimental to New Jersey residents.” LoBiondo, who also opposed the GOP health care bill, recently announced he is not running for re-election, making his seat more vulnerable to a Democratic takeover. Trump carried his 2nd District by nearly 7 points in 2016. The race is rated Leans Republican. McClintock, who opposed the curtailing of the SALT deduction, is also a new DCCC target. Trump carried his 4th District by 16 points and McClintock won re-election by 24 points. Inside Elections rates the race Solid Republican. Rohrabacher told Roll Call before the vote that his vote would be determined by how his constituents would fare if the bill became law. He is one of the most vulnerable House members in 2018, in part because of his ties to Russia. He is a top DCCC target. Clinton carried his 48th District by 2 points in 2016 while Rohrabacher won re-election to a 15th term by 17 points. Inside Elections rates the race Tilts Republican. Smith was also opposed to curtailing the SALT deduction. First elected in 1980, Smith is running for a 20th term next year in a race rated Solid Republican. Trump won his 4th District by 15 points in 2016. She joined her New York GOP colleagues in opposing the bill due to the changes made to the SALT deduction. The second-term congresswoman is head of recruitment for the National Republican Congressional Committee. She is also a DCCC target. Trump carried her upstate New York district by 14 points in 2016, and she was re-elected by 35 points. Inside Elections rates her race Solid Republican. The Long Island congressman also voted against the bill because of the SALT deduction changes. Zeldin is a DCCC target. Trump carried his district by 12 points while Zeldin won re-election by 16 points. Inside Elections rates the 1st District race as Solid Republican. Simone Pathé and Lindsey McPherson contributed to this report.Get breaking news alerts and more from Roll Call on your iPhone or your Android.